Rivers of a Lost Coast from Skinny Fist on Vimeo. The rapid decline of our planet’s fisheries is well documented. The devastated fisheries of northern California are a microcosm of the planet’s larger problems. Once a major salmon producing region, in 2008 state and federal agencies agreed upon a complete closure of ocean and recreational fishing off the California coast. While much attention has turned to the crippled commercial fishing industry, Rivers of a Lost Coast examines the situation through the unique, little-known history of California’s north coast fly fishing community. From this rare perspective, this documentary provides a symbolic, melancholy reflection on a wild California that has been lost to the growing metropolis. Rivers of a Lost Coast follows California’s coastal fly fishing community through the rise and collapse of one of the world’s most magical fisheries. To some, this is a story about time and place, about a California that was. To others, it is a story about who we are, what we need and where we are going. Check out this 2 minute trailer and visit the Rivers Of A Lost Coast web site for further details. Screenings begin in early 2009. Great summary of 'Rivers of a Lost Coast'. We hope to shed some insight into the state of our precious rivers and how we got into the situation we find ourselves in today. Are all our rivers from the East Coast to the West Coast spiraling into the same bleak destiny or can we learn from our mistakes and preserve what we have left? I would like us to not only preserve what we have left, but work to restore some of what we've lost. Thanks for the viewpoints Palmer and Richard. 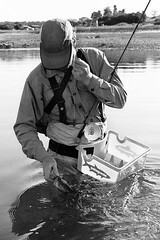 When I read the words "preserve what we have left" I thought of an earlier post about James Prosek and World Trout where James states those exact words - http://www.wayupstream.com/2007/08/preserve-what-we-have-left.html. The bottom line is in order to preserve, protect and restore, we anglers need to take action. Consider what you can do to help preserve what currently exists. In the case of World Trout it's as easy as buying a t-shirt. I have something bigger in mind. I'll let you know, 'cause I'm going to need some help. It'll be a couple years yet. Definitely keep us all in the loop Richard. We're ready to help.